TGIF Team Stryker fans! Sorry for the later than usual post, I was experiencing server issues. Hopefully you all agree that seeing the pencils to page 04 is worth the wait! 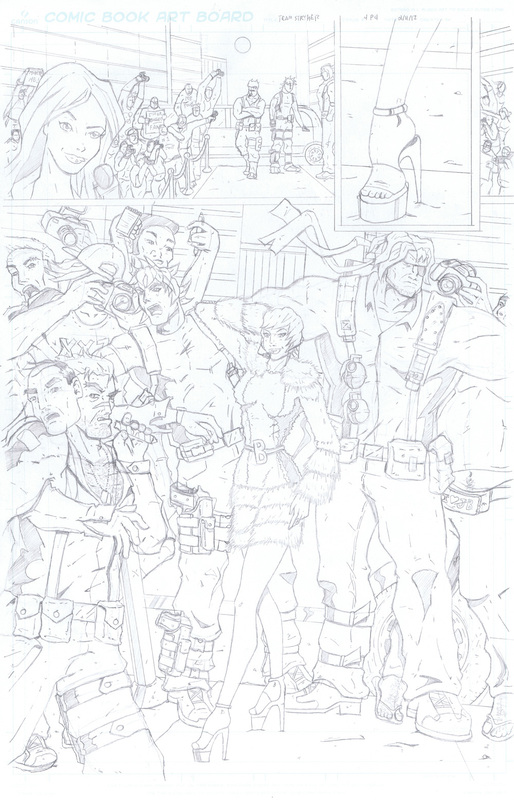 I don’t think in all my years doing Team Stryker that I’ve had to draw a more packed page than this one. When I did the roughs for it I had no idea what I was in for. I really wanted to nail that claustrophobic feel you get when you see celebrities on the red carpet getting ambushed by paparazzi. It can be hard to make a page seem busy and still have a clear focal point. I knew that Justine Beaver had to be the center of attention so I made sure that everything else flowed towards her. Giving each member of Team Stryker the task of blocking the hordes of reporters and cameramen was fun as I tried to show how differently they all handle the same situation. Casanova was fun to pose since he isn’t the largest member but is trying to take up as much space as possible. I had to redraw Deadeye a couple of times as I couldn’t get his proportions to match his newest character sheet. I want him to feel like a gorilla with an eye patch. I kept drawing his legs too long which takes away from how beastly his upper body is. Posing Eagleheart’s smoking arm was difficult only due to trying to figure out if his arm should be at the side of his chest or in front. I eventually got it to a point where I was happy with it. Have a great weekend everyone and be sure to check back on Monday for page 05!